One of the most important changes of the last 30 years is that digital technology has transformed almost everyone into an information worker. A lot of people assume that creating software is purely a solitary activity. This isn’t true at all. That’s true for everyone from the retail store worker who uses a handheld scanner to track inventory to the chief executive who uses business intelligence software to analyse critical market trends. So if you look at how progress is made and where competitive advantage is created, there’s no doubt that the ability to use software tools effectively is critical to succeeding in today’s global knowledge economy. A solid working knowledge of productivity software and other IT tools has become a basic foundation for success in virtually any career. Beyond that, however, I don’t think you can overemphasise the importance of having a good background in maths and science. If you look at the most interesting things that have emerged in the last decade – whether it is cool things like portable music devices and video games or more practical things like smart phones and medical technology – they all come from the realm of science and engineering. Today and in the future, many of the jobs with the greatest impact will be related to software, whether it is developing software working for a company like Microsoft or helping other organisations use information technology tools to be successful. Communication skills and the ability to work well with different types of people are very important too. This isn’t true at all. I also place a high value on having a passion for ongoing learning. When I was pretty young, I picked up the habit of reading lots of books. It’s great to read widely about a broad range of subjects. Of course today, it’s far easier to go online and find information about any topic that interests you. Having that kind of curiosity about the world helps anyone succeed, no matter what kind of work they decide to pursue. 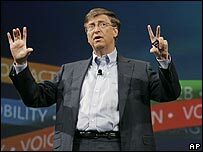 Bill Gates is chairman, chief software architect and one of the founders of Microsoft, the world’s largest software company. 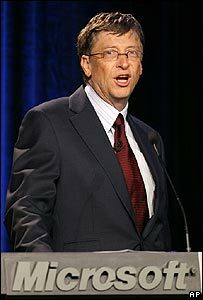 From July 2008 he will end his day-to-day involvement in the company and focus on the Bill and Melinda Gates Foundation and its global health and education work.